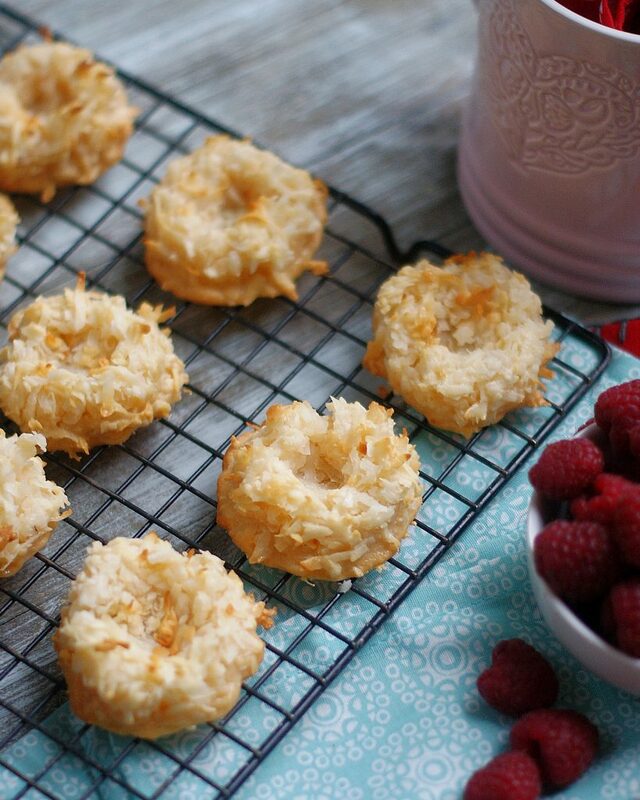 Coconut macaroons are a wonderfully easy and fabulous little treat. 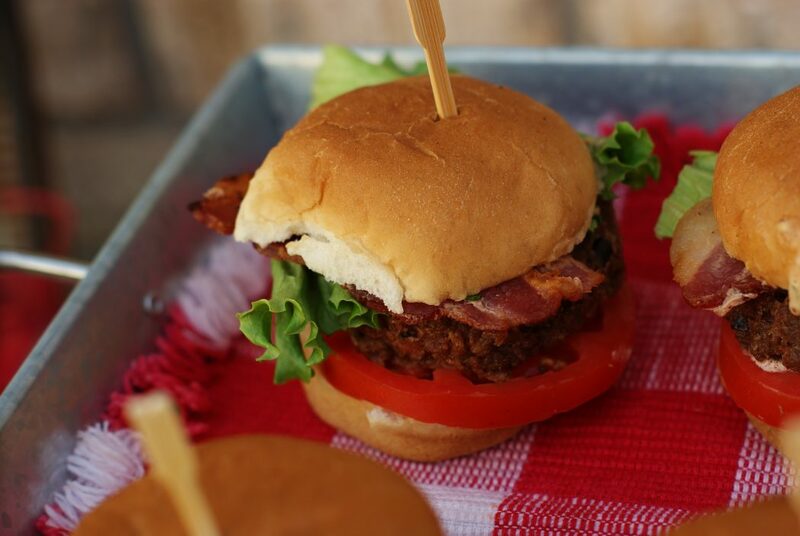 After all when your main ingredients are sweetened coconut and condensed milk, how can you really go wrong? 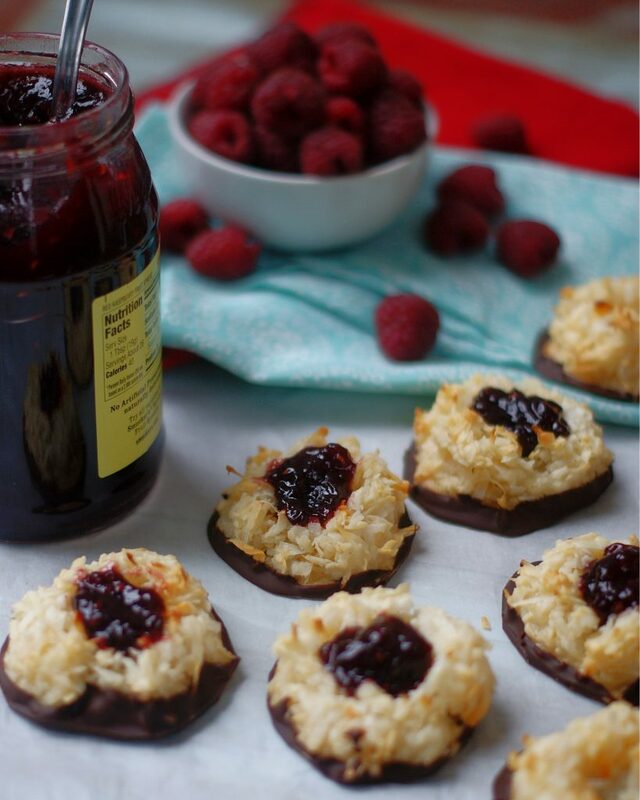 But make them a Coconut Thumbprint Macaroon by filling them with raspberry jam and dipping them in dark chocolate… well, now you’re talking “we’re having a moment here” good. 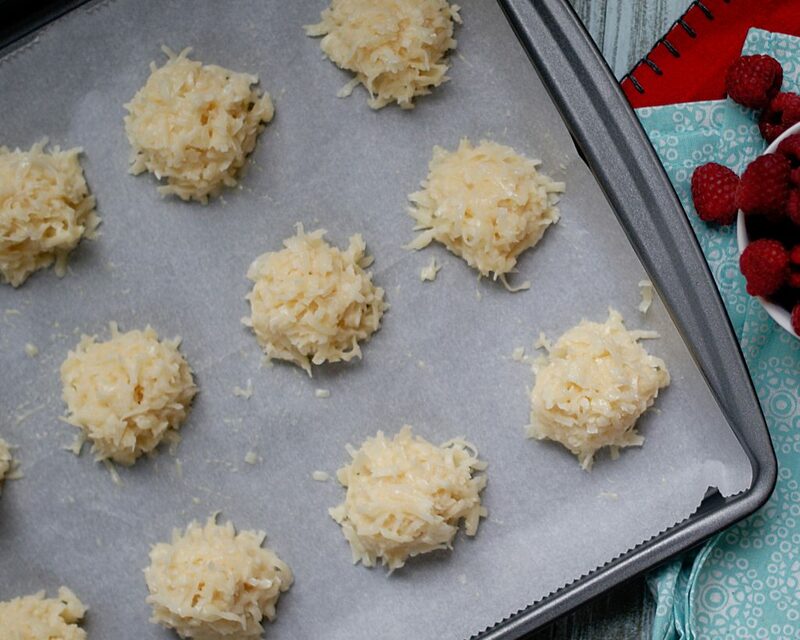 The macaroons themselves are just a mixture of flaked coconut, condensed milk, a little vanilla and egg white. Whisked together and scooped up, they make perfect little snowballs that in 15 minutes will be gorgeously decadent chewy bites of coconutty goodness. Now, we could stop there. (Truth be told, some of them did stop there because, honestly I ate one or two. You know, just as a test.) 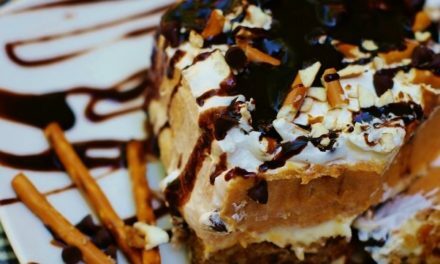 But with just a few easy steps, we can amp up this traditional dessert into something really special. While the macaroons are still warm, it’s simple to make a little hollow in the tops that we can later fill with jam. For these, I chose raspberry. But you could choose whatever you like. The final steps have us dipping the macaroons in a little dark chocolate and topping them off with dollop of fruity sweetness. Aren’t these just wonderful? 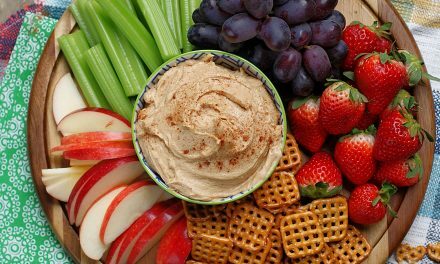 You could box these up in a dessert box and give them as a special gift, take them to a shower or serve them with tea or coffee as you catch up with a good friend. 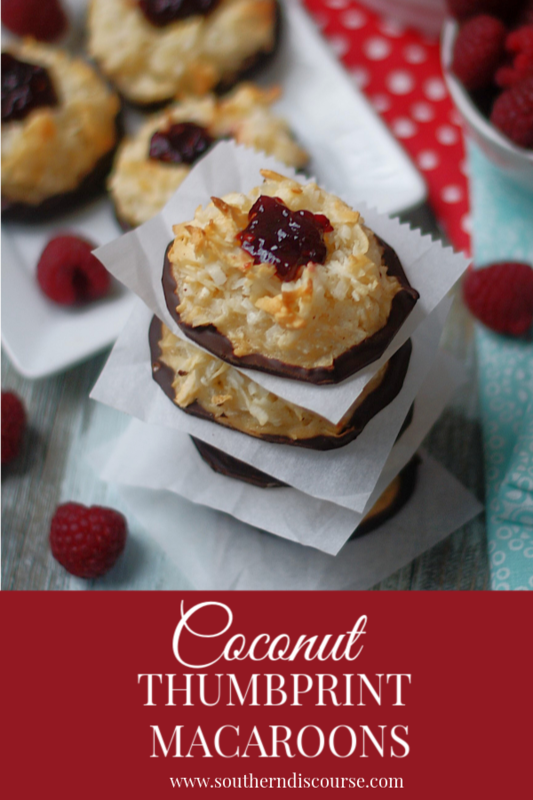 Sweet coconut and condensed milk make an easy, moist macaroon that's filled with raspberry jam and dipped in dark chocolate! Preheat oven to 325 degrees Fahrenheit. Line baking sheet with parchment paper. In a medium mixing bowl, mix together condensed milk, egg white and vanilla. Whisk until frothy. Fold in coconut a little at a time until all is well incorporated. Spoon rounded tablespoons of coconut mixture onto parchment lined baking sheet. 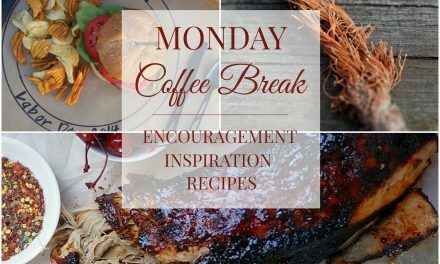 Bake in preheated oven for 15-20 minutes or until coconut is lightly browned. Remove from oven. 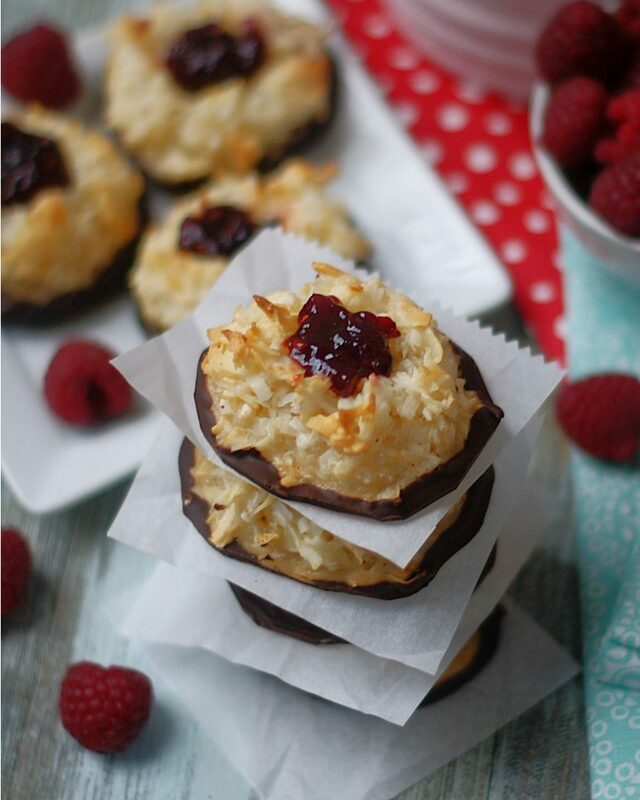 While macaroons are still warm, press thumb or end of spoon into top of macaroon to make a well for jam filling. Gently remove macaroons from pan to cooling rack. Let cool completely. Melt chocolate in microwave, heating for 30 second increments and stirring until smooth and shiny. 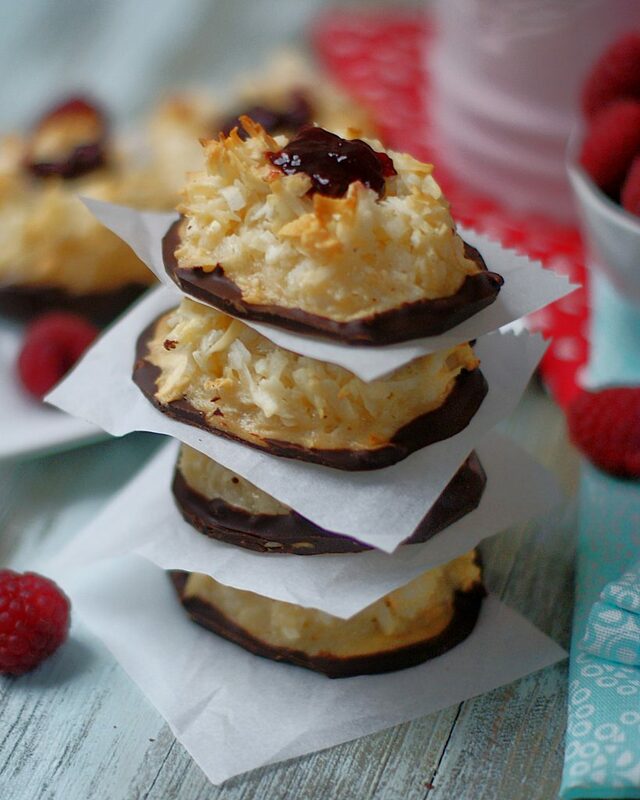 Dip bottoms of cooled macaroons into chocolate and place on wax or parchment paper until chocolate sets. 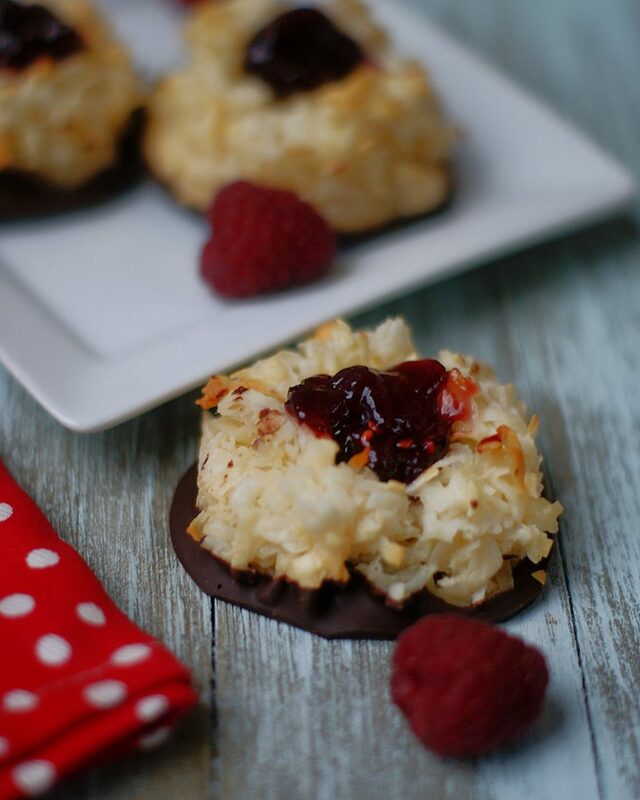 Fill wells of macaroons with a spoon of raspberry jam and serve when chocolate is set.